This is BMW‘s new X5, the second in it’s generation since it’s release back in 1999. Like it’s predecessor, BMW calls the new E70 a Sports Activity Vehicle or SAV rather than an SUV, as BMW says it’s dynamics are a step above it’s rivals’ utilitarian construction. So what’s new with BMW’s flagship 4WD? More details after the jump. One of the key points of improvement in this new BMW X5 over the previous version is third-row seating. 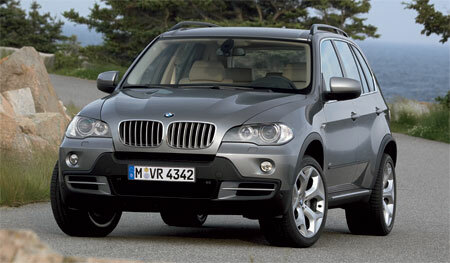 The previous BMW X5 only seated 5, which made it unattractive for people with large families. 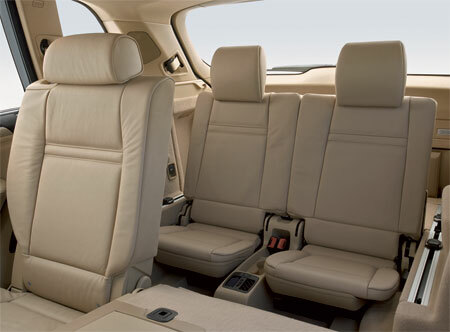 This third row is optional, and with the third row seats installed the new BMW X5 seats 7, 2 in front, 3 in the middle and 2 at the back. To accomodate this extra seating, the X5 has grown longer by 19mm and wider by 6mm. With all seats in place, the X5 still has a comfortable boot space of 200 litres, but when you remove them this storage grows to 620 litres. This is up 155 litres compared to the first generation BMW X5. Power and torque has also gone up across the model range. 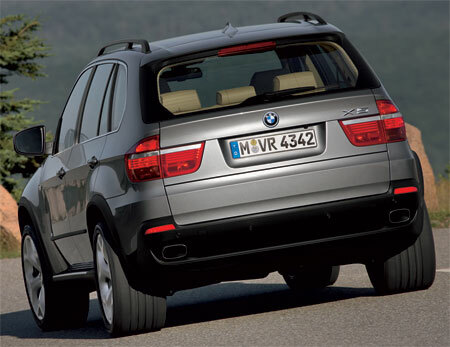 The BMW X5 3.0 receives 41hp power boost, bringing it up to 272hp from the previous 231hp figure. Torque goes up from 300Nm to 315Nm. The X5 3.0 goes from 0-100km/h in 8.1 seconds, and has a top speed of 225km/h The turbodiesel BMW X5 3.0d now makes 231hp and 520Nm torque, successing the previous model that only has 204hp and 480Nm torque. 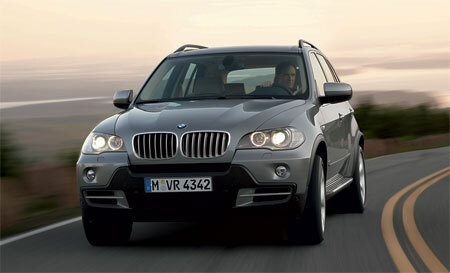 The top of the range BMW X5 4.8i has it’s power upped to 355hp and 475Nm of twisting action, up from 320hp and 440Nm. Top speed is 250km/h. Note that all three top speed figures are with the Dynamic Package offered by BMW, without it top speed for all three X5s are limited to 210km/h. It looks like has made significant improvements to the turbodiesel engine in the BMW X5 3.0d, with fuel efficiency increased and more than a second shaved off it’s 0-100km/h acceleration time. The new six-cylinder turbodiesel is 25kg lighter than the previous engine thanks to a new all-aluminium crankcase. 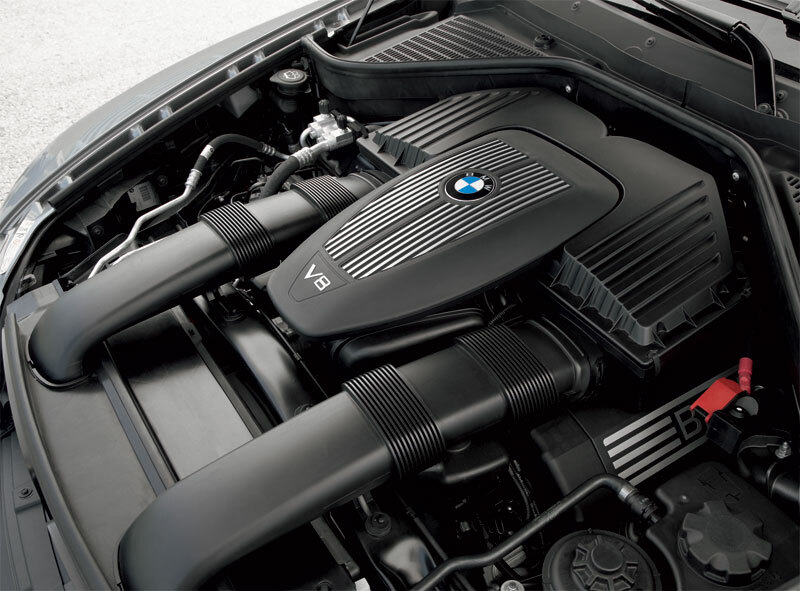 The BMW X5 3.0si’s six-cylinder petrol engine features Double VANOS (when the engine valves open) and VALVETRONIC (how much they open). The BMW 4.8i stats are a little tricky, as I could find the old X5 in 4.8si form, but the new X5 is a 4.8i, which explains the power drop in my comparison. Even for the 3.0 petrol, I am comparing the old 3.0i to the new 3.0si, because that is what BMW provided with the new model’s press release. Improved acceleration times are partly because of the new six-speed automatic gearbox that comes with the new E70 BMW X5. The new torque converter allows 50% quicker shifts. 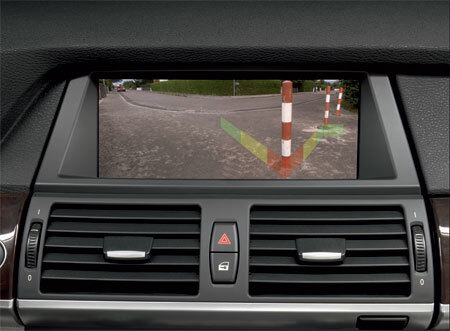 New interior enhancements include BMW’s iDrive controller and a HUD display. There is also an electronic parking brake instead of the conventional design. Other improvements enhance the driveability of the car – Adaptive Drive and Active Steering. Adaptive Drive uses a combination of active hydraulic anti-roll bars and electronic damper control to counteract body roll during cornering. The Active Steering system varies steering lock for a more comfortable steering experience – more lock at slow speeds for easier parking and the opposite for highway speeds for a smoother, more composed drive. Brake Pre-tensioning – primes the brakes for fastest braking action when system detects the driver lifting his foot off the accelerator in a sharp reaction. Brake Drying – improves wet braking performance by periodically applying the brakes to scrub away the film of water that builds up on brake discs. Hill Start Assistant – Automatically applies the brakes while the driver moves his foot from the brake to accelerator pedal on uphill terrain to prevent the vehicle from sliding backwards. Brake Fade Compensation – Applies extra braking force automatically when sensors detect brake fade due to heat build up. Video above shows the BMW X5 accelerating and braking perfectly with half the car on ice and half the car on pavement. Also demonstrates hill ascend. The BMW X5 showing off it’s stuff on icy terrain. This time on desert terrain. Two E70 BMW X5 SAVs on a snowy road. The BMW X5 4.8i’s V8 engine. The BMW X5 on normal road pavement, where you’ll likely see it spending most of its time on despite it’s off-road abilities. 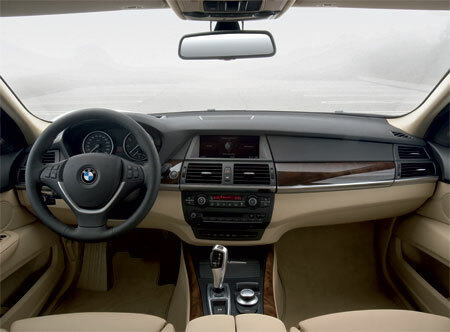 The E70 BMW X5 interior.